The "L" Shaped Modular Raised Garden Bed offers 80 Square Feet of garden area. With easy access, your veggies are within arm's reach. This unit fits nicely in a corner or anywhere you want to plant vegetables, fruit or herbs. Raised beds are planters with open bottoms so plant roots can penetrate the ground below. With these beds you eliminate tilling, soil amending, and minimize weeding. They are quick and easy to assemble, plant and maintain. 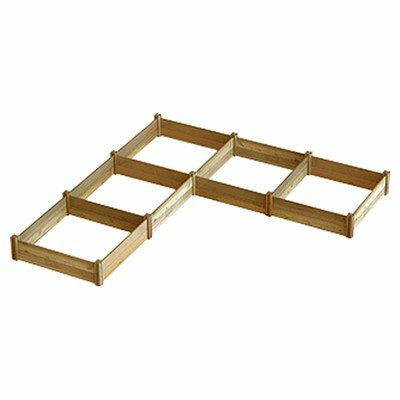 Easily adapt square foot gardening techniques to these beds. The rough sawn rustic appearance looks great in any setting. Cedar Raised Garden Bed 2' x 4' x 15"